• We are proud to release the first contemporary text written about the history of Gowanus Canal, through its current state of flux. The Glory Of Brooklyn�s Gowanus begins with historical excerpts of the Dutch West India Company, land sales, encounters with the indigenous population, early slavery in Brooklyn, and the Revolutionary War. The text illuminated by reproductions of early maps and lithographs. The second section consists of archival photographs, and bills of sale from nineteenth century industries along the shores of the Gowanus Canal that had a hand in creating the now infamous pollution. In addition, it examines into the lives of the population that called the surrounding area home through the nineteen sixties. As the early history of the canal is presented in the first section of the book, section three begins with the earliest know artists of import, inspired by its pre-industrial, purported inexplicable beauty. The remainder of section three showcases the work created by Gowanus-based and_inspired artists, and the multi-use performing spaces that have made the area Brooklyn�s new frontier. Hardcovered, 128 pages, full color and duotone, hard covered sewn signatures, glossy stock. 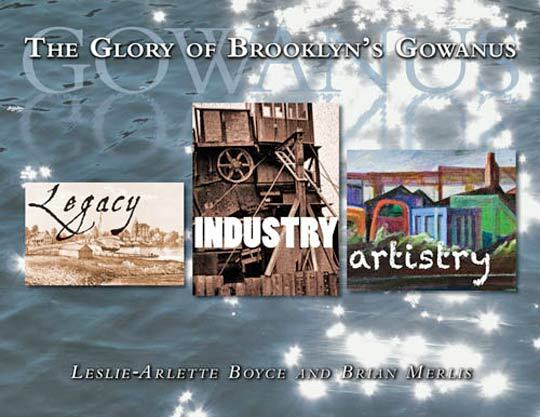 • Profusely illustrated with HUNDREDS of maps, illustrations, and vintage photographs, Leslie-Arlette Boyce and Brian Merlis, authors of The Glory of Brooklyn's Gowanus: Legacy Industry Artistry, take readers on another unforgettable journey back in time. A MUST for any collector. • Hardcovered, 128 pages, full color and duotone, hard covered sewn signatures, glossy stock. • Printed in the United States of America! !.